LAS VEGAS – Las Vegas Convention and Visitors Authority and McCarran International Airport will play host to Routes Americas, the 10th Route Development Forum for the entire Americas region, when the event takes place in Las Vegas in 2017. Routes Americas is the essential route development event for all aviation based companies who wish to conduct business to, from and within the region. The event brings together a range of airlines, airports and tourism authorities, including some of the largest carriers from North, Central, Latin America and the Caribbean. Named as North America’s leading meeting and convention destination for 21 consecutive years, Las Vegas hosts more of the leading conventions than any other destination in the United States. Hosting over 22,000 conventions, events and conferences a year and welcoming nearly 5.2 million convention attendees in 2014, Las Vegas is the ideal destination for Routes Americas 2017. The Las Vegas Convention and Visitors Authority works to attract visitors to the city by promoting Las Vegas as the world’s most desirable destination for leisure and business travel. Tourism is the city’s number one industry and more than half of those visitors arrive in Las Vegas by air. With more than 900 inbound and outbound flights per day and nonstop services from 135 US and international cities, McCarran International Airport acts as an important gateway for nearly half of Southern Nevada’s approximately 41 million annual visitors. In 2013, Las Vegas was the first US city to host World Routes, which saw a record number of delegates in attendance. Following the event, new routes were secured with, amongst others, Edelweiss Air serving Zurich, Alaska Airlines serving Anchorage and Salt Lake City, Allegiant Air serving Texas and Southwest Airlines serving Des Moines and Flint. “McCarran International Airport greatly anticipates the arrival of Routes Americas in 2017. This event provides us with a wonderful opportunity to showcase Las Vegas before key airline decision makers, and it will allow attendees to see first-hand Clark County’s exceptional airport, including its state-of-the-art technology and expanded U.S. Customs and Border Protection facilities,” said Clark County Director of Aviation Rosemary A. Vassiliadis. Known globally for its unparalleled mix of world-class resorts, entertainment offerings and nearby stunning natural attractions, Las Vegas is a fascinating city that also means business when it comes to conventions and events. It looks forward to showcasing the myriad of experiences that make it a unique leisure and business destination, while expanding its current air services even further. About LVCVA The Las Vegas Convention and Visitors Authority (LVCVA) is charged with marketing Southern Nevada as a tourism and convention destination worldwide, and with operating the Las Vegas Convention Center and Cashman Center. With nearly 150,000 hotel rooms in Las Vegas and nearly 11 million square feet of meeting and exhibit space citywide, the LVCVA’s mission centers on attracting ever increasing numbers of leisure and business visitors to the area. For more information, go to www.lvcva.com or www.lasvegas.com. Follow us on Twitter @LVCVA. About McCarran International Airport McCarran International Airport is located in the shadows of the world-famous Las Vegas Strip and is the gateway for nearly half of the people who visit Southern Nevada each year. 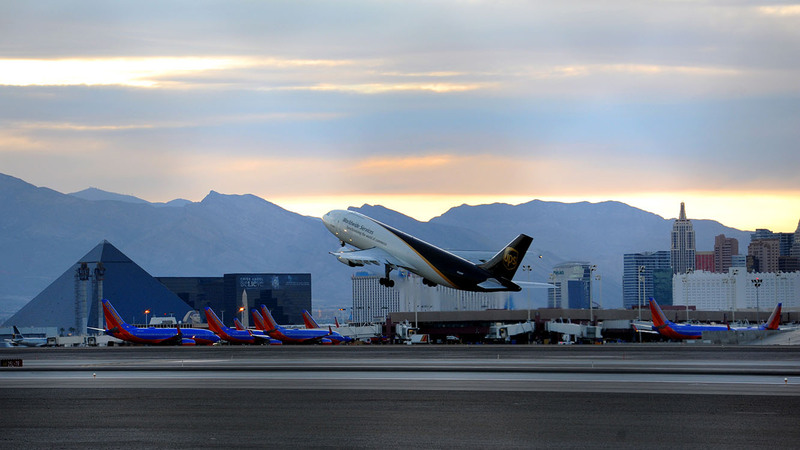 Including arrivals and departures, McCarran hosted nearly 43 million passengers in 2014, making it the ninth-busiest airport in North America. With more than 30 airlines providing nonstop service to more than 140 destinations, McCarran makes it possible for the world to experience one of the most alluring travel destinations. McCarran International Airport is owned and operated by Clark County, Nevada, and does not benefit from local tax dollars. • Routes was founded in 1995 as part of the Manchester UK‐based ASM Ltd., a consultancy specialising in the field of route development for airports. www.asm‐global.com. Routes and ASM are part of the UBM EMEA division of UBM plc. • UBM EMEA connects people and creates opportunities for companies across five continents to develop new business, meet customers, launch new products, promote their brands and expand their markets. Through premiere brands such as MD&M, CPhI, IFSEC, TFM&A, Cruise Shipping Miami, the Concrete Show, the Routes portfolio of events, Airport Cities and many others, UBM EMEA exhibitions, conferences, awards programs, publications, websites and training and certification programs are an integral part of the marketing plans of companies across more than 20 industry sectors. About UBM plc • UBM plc is a global events-led marketing services and communications company. We help businesses do business, bringing the world’s buyers and sellers together at events and online, as well as producing and distributing news and specialist content. Our 5,500 staff in more than 30 countries are organised into expert teams which serve commercial and professional communities, helping them to do business and their markets to work effectively and efficiently. • For more information, go to www.ubm.com; follow us on Twitter at @UBM_plc to get the latest UBM corporate news; follow @UBM for news from all UBM’s businesses; follow @UBM for a flavour of UBM from selected members of UBM’s Twitterati.